Desk mat with calendar for 4 years. With transparent overlay. Desk mat with calendar for 4 years. With an anti-glare and replaceable overlay. Crystal-clear, anti-glare overlay for desk mat item no. 7205. Transparent and anti-glare desk mat. Ideal for keeping notes etc close to hand. Desk mat with edge protector and transparent overlay. Elegant desk mat in premium quality for optimum writing comfort. Desk mats of premium quality leather with a decorative edge. Desk mats of premium quality leather in a compact size. Ideal for conference and seminar rooms. Desk mat with a glued calendar block for 2 years. Replacement calendar block with 25 sheets for desk mat item no. 7291. Desk mat with calendar for 2 years. Calendar block with 25 sheets with "Tropical Beach" motif. Calendar block with 25 sheets with "Tropical Beach" motif. Replacement block for desk mat item no. 7311. Desk mat with calendar for 2 years. Calendar block with 25 sheets with "Pinewood Panels" motif. Calendar block with 25 sheets with "Pinewood Panels" motif. Replacement block for desk mat item no. 7312. Desk mat with calendar for 2 years. Calendar block with 25 sheets with "African Wildlife" motif. Calendar block with 25 sheets with "African Wildlife" motif. Replacement block for desk mat item no. 7313. Desk mat with calendar for 2 years. Calendar block with 25 sheets with "Bright Curves" motif. Calendar block with 25 sheets with "Bright Curves" motif. Replacement block for desk mat item no. 7314. Desk mat with comfortable writing surface and contoured edges. Desk mat with transparent overlay. Attractive desk mat in trapezium shape. With transparent overlay. Attractive desk mat in trapezium shape. Desk mat in semi-circular, ergonomic shape. With transparent overlay. Desk mat in semi-circular, ergonomic shape. Transparent desk mat in a compact size for conference and seminar rooms. Desk mat in a compact size for conference and seminar rooms. Desk mat with world map motif. Functional and compact desk mat. With 3-part register as overlay for notes. Can also be used as a mouse pad. Modern desk mat in an innovative shape. With pen holder and transparent overlay. 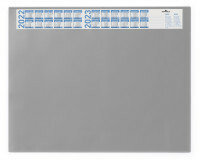 Calendar strip for 4 years for DURABLE desk mats.